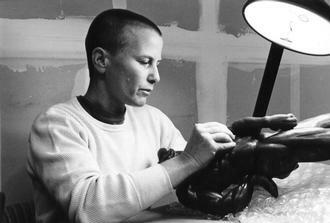 My bronzes are made by the lost wax method. Despite being an ancient approach, with a few modern tricks it is still the best way to create a clean reproduction of a complex, 3-D original. The clay I use is CHAVANT NSP HARD plastilene. It is an oil-based, non-drying clay that is otherwise unhyphenated. I am lucky that it does not dry, because I take so damn long: about 8 to 12 months on an original HYBRID. When the master is finished, it is time to take it to the foundry. 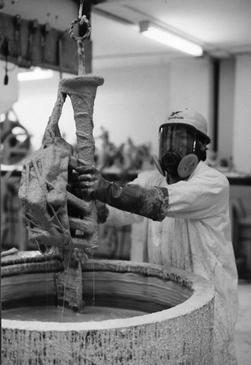 The first step at the foundry is the making of the mother mold. A mother mold is a reusable mold for the making of waxes. It consists of flexible silicone rubber which conforms exactly to the original sculpture, enclosed in a rigid plaster/fiberglass case. Both the rubber and the case are created in mated sections, connected by partable seams, to allow for the opening and closing of the mold. The moldmaking process is often destructive to the master, which means, yes: 8 - 12 months of work could be shot to hell here!!! There is no turning back!!! We're all gonna die!!! Kindly get hold of yourself. When cured, the mother mold is removed from the master and closed up empty. 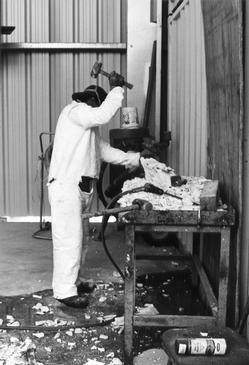 Hot wax is poured into and out of the mold, which is rocked by hand, until a layer about 3/16" thick is built up inside. 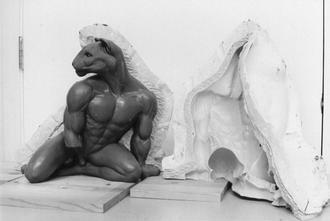 The result is a wax version of the original sculpture. This wax version is hollow, like a chocolate Easter bunny because the bronze must be hollow. If it is not, the metal will shrink and distort as it cools, resulting in a crappy reproduction, and I hate that. Once the wax has set up, the mother mold is removed, and the wax is chased. (Waxes are fast: Ever try to catch one?) This means seams are cleaned up, bubbles are filled, and any lost detail is restored by hand. 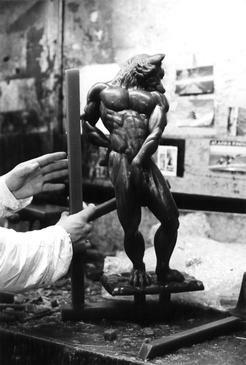 For this reason, and others, each bronze casting is a unique piece of art, differing slightly from its sister castings. I personally do hours and hours of work on every one before I sign and number it. In a small, limited edition, a wax may be marked, "3/12." This signifies that it is number three of a total edition of twelve castings (plus an unnumbered artist's proof, or two). After all the numbers in the edition have been cast, the mother mold is destroyed so that no more waxes or bronzes of that master can be made. 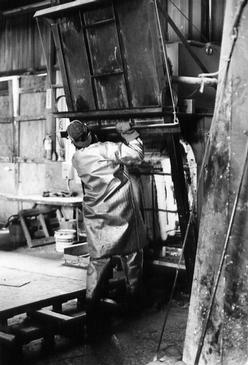 In order to allow access to and inspection of the wax's interior, ports called patches are cut into the signed wax. These ports become critical during shell application, and are also used to check for flaws in the wax's thickness which could cause casting problems. 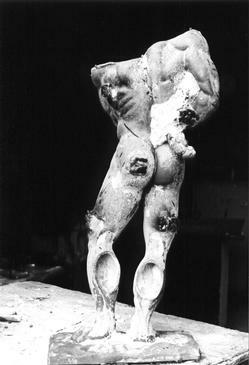 The patches are cast separately from the rest of the figure and later welded back in place. How the foundry manages to keep the right patches with the right sculptures, is one of the great mysteries of life. If you know, don't tell me; it will ruin everything. 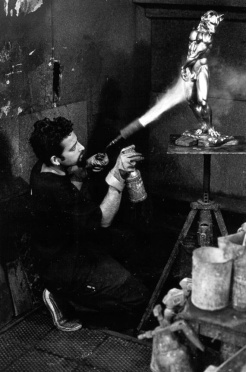 To insure that molten bronze will flow throughout a stationary shell, without air pockets forming, the wax is gated by welding wax sprues to the wax sculpture in critical areas, and connecting the pour funnel, or cup. Even though the sculpture looks like it has been attacked by an octopus at this stage, all that is added will eventually be removed. We now come to the making of the shell. While the mother mold -- the mold into which all waxes are poured -- can be used again and again; each wax requires its own shell: a thin, rigid mold which can only be used once, since it is destroyed as it is removed from the bronze. The shell is made by dipping the gated wax into a mixture of silica and a high-tech, ceramic slurry which completely coats the wax. 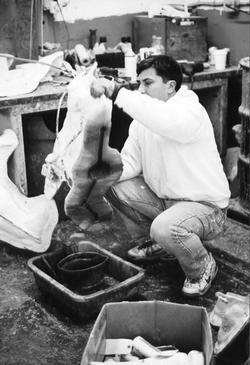 This mixture covers everything but the opening of the pour cup: it goes inside the sculpture, outside the sculpture, and encases the sprues before it is hung to dry. Now it is time for burnout. The shell is placed in a kiln where it hardens like a clay pot while the wax inside it melts, boils, and ultimately vaporizes, (hence the term, "lost wax,") leaving a lovely little 3/16" gap between its inside and outside for our cuddly bronze "Easter Bunny" to get poured into. 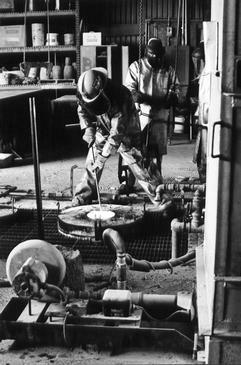 The fired mold, which can now withstand extremely high temperatures, is allowed to cool before it is filled with water to test its integrity. Ingots of Silicon Bronze 873 are melted to over 2000 degrees F in a silicon carbide crucible while the tested mold is reheated in the kiln to bring it up to temperature. The composition of this bronze, which is preferred for sculpture because of its low porosity and high purity, is 94% copper, 4% silicon, 1% manganese, and 1% trace elements. 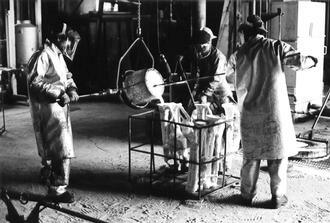 Once the bronze has melted completely, the hot mold is brought out in a rack with several other molds, the crucible is lifted, and three people carefully fill the molds with molten metal. One person controls the hoist and leads all movement of the crucible, one supports and matches the movements of the leader, and one skims any impurities away from the edge of the flow so that crud does not get into the castings. If the thought of burning your foot off doesn't get to you, this can be a lot of fun. The metal finisher welds any parts that were cast separately back into place, (including the mysterious patches); sands the surface smooth where it should be, retextures it where it needs to be; and with my assistance, does any fabrication work, such as the copper rope in HYBRID TWO, which we make, fit, and solder to the sculpture. I give the piece its final inspection, and then make my appointment with a patina artist. Patina means "paint" in Italian, but you knew that and now consider me a pedant, even after all I have done for you. It refers to the coloring of the bronze, and it is achieved with a combination of caustic chemicals, a 2" wide blowtorch, a gift for mind reading, and a complete lack of ego. 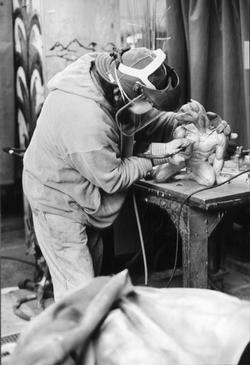 Not only is this stage of the process technically and artistically difficult, but the patina artist has to do his work with the sculptor supervising, which is why the term, "justifiable homicide," was originally coined. 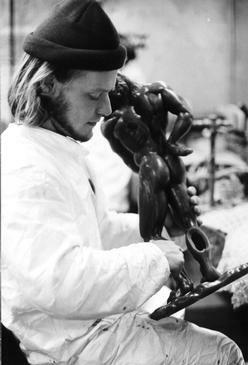 With the exception of the creation of a plastilene master and the making of a mother mold, this entire process is repeated for every bronze in a limited edition.